If you have an extra weekend and $20 burning a hole in your pocket, then a DIY home improvement project may be just what the doctor ordered. We've compiled a list of some of the best DIY home improvement projects that can give your home a facelift, without making a dent in your pocketbook. These affordable upgrades can add curb appeal and even value to your property, without requiring a large investment of time or money. A fresh coat of paint can completely transform a room or piece of furniture. Experiment with different colors and trims to update any room in your home. If you don't feel like painting the whole room, consider adding an accent window frame or accent wall by choosing one or two walls to paint. You can even add stripes or dots to any wall for a unique, sophisticated touch. While you're at it, add a fresh coat of paint or spray paint to your air vent covers. Adding new paint to the front door will make it feel and look completely fresh and renewed as soon as you or a guest drives up. Often, a door can become covered in scuff marks, signs of weather changes, and other exterior damage. A fresh coat of paint can help cover that damage and make your door look like new again. While you're at it, consider painting the inside of the door as well, which can add an exciting accent to your home. It should only cost you about $15 for the paint and supplies. Choose an inexpensive fabric treatment to update the window in your kitchen, bathroom, or bedroom. Drapes and window coverings are available in all different colors, designs, and price ranges, so you can find the perfect fit for any room. You can even use fabric remnants on small windows. Install a premade magnetic, cork, or dry erase message board on any wall. Buy chalkboard paint and paint any surface you like for an instant chalkboard message center anywhere. You can even add chalkboard paint to your cabinets to draw or write inspirational words. Use an inexpensive glass panel to create a DIY dry erase board. You can then paint the back of the glass panel to match your kitchen or office decor and color scheme, and frame the glass panel to complete the look. Wall decals are extremely affordable, simple to install (they work like a sticker), and can completely change the look of any room. They can be applied in an office, bedroom, kitchen, or bathroom, and are available in a variety of colors and designs. You can also use self-adhesive and repositionable wallpaper to create a unique accent on any wall. You can experiment with different patterns, colors, or even shapes! Installing new doorknobs or spray-painting old ones can transform the look of any door, making it look more polished. The same can be done for the handles and drawer pulls on any of your cabinetry. These are simple projects that won't cost much and can make old doors and furniture feel like new. Hooks can be easily added to any room to increase space and allow you to hang up things like your bathroom towels and robes. Consider adding hooks or shelving to your closet for an instant storage upgrade. You can also install floating shelves in your bedroom, office, or bathroom. This can add the extra storage you need to better organize any room. You can also use them to display unique artwork, vintage finds, and other decorative items that display your personal style. Adding labels, dividers, and clear plastic bins can help instantly organize things and make it easier for you to locate all of your items at a glance. If you decide to add more storage, keep your eyes open for used or refurbished furniture that you can use around your home. With the right paint and handles, any furniture can be transformed. Whether we like it or not, electrical plate covers and wall outlets are in every room of the house. Take a look at yours and replace any that are cracked, stained, or just need an upgrade. There are a variety of affordable electrical plate covers to choose from, or you can paint your current switch plate and install an affordable frame around it for a decorative flair. While you're at it, consider also replacing your wall outlets or upgrading to USB wall outlets, which can also charge your mobile device. The numbers in the front of your home are the first things a guest will look for as they're driving by looking for your home address. You can easily and affordably install new metal or wooden house numbers or simply add a fresh coat of spray paint to your current ones. You can also install a new doorbell for under $20, adding a modern, vintage, or retro flare to your home. Decorating with potted plants, hanging plants, and flowers is a home improvement project that will continue to provide benefits to your home over time. Visit your local nursery to speak with someone about what plants may be right for you, based on how often you want to garden, your budget, and the look you are trying to achieve. With the right plants and flowers, you can add a decorative touch that welcomes you and your guests. Nothing transforms a home like getting rid of clutter and giving the place a good cleaning. Give your home a spring cleaning by shampooing the carpets, cleaning the furniture and upholstery — and don't forget about your filters and vents. Get rid of what you aren't using and donate what you can. This will instantly make your home feel bigger and can even help clear allergens. 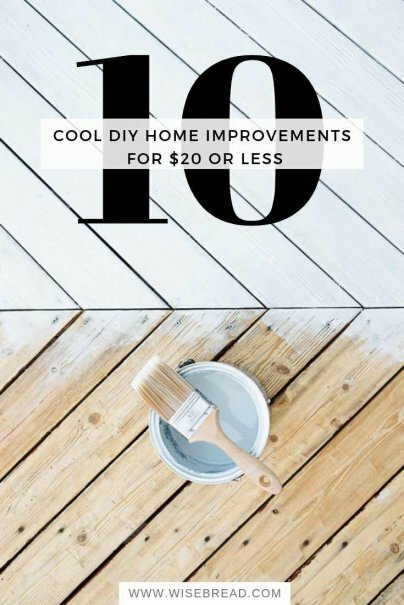 What are your some of your favorite DIY projects under $20? Please share your thoughts in the comments! Good tips. One other upgrade can be to change out standard shower heads with ones that have several stream options. That's a good list! One other inexpensive DIY project is to add a shelf in a closet. Provided there is adequate space away from lighting, many clothes closets have wasted space near the ceiling. I have added an additional shelf in all our clothes closets to take advantage of the top one foot.